This serum is a high potency multi-C cocktail that drenches the skin with powerful time releasing anti-oxidants. 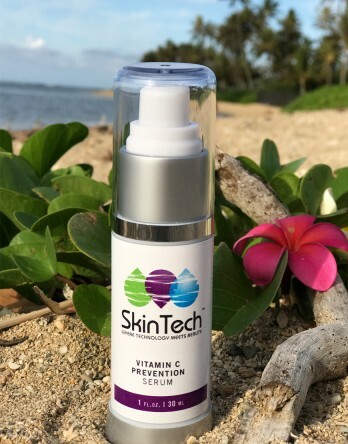 Sodium Ascorbyl Phosphate and high ORAC (Oxygen Radical Absorbance Capacity) scoring Kakadu Plum, Phloretin, Astaxanthin, Ferulic Acid and Vitamin E offer advanced protection from photo-aging and dermal instability caused by free radical aggression. Apply 1to 2 pumps of serum to face and decolette each day and night following thorough cleansing of skin. Ideally used in the day time to prevent UV damage and hyperpigmentation. May be used under moisturizers. • Sodium Ascorbyl Phosphate – A new, very stable, precursor to Vitamin C. Considered gentle and stable, it converts into Ascorbic Acid once it is absorbed. Therefore, it is thought to be a powerful antioxidant that can treat acne on the surface and even stimulate collagen, according to RealSelf.com. It also has skin-lightening abilities Also helps to prevent breakdown of cells due to environmental exposure. Anti-inflammatory properties soothe damaged skin. • Astaxanthin - Strongest anti-oxidant vitamin in nature, dervived from Algae. Is 550 times more effective than vitamin E.
• Emblica - Derived from Phyllanthus Emblica fruit. It is a free cascading anti-oxidant that promotes skin lightening reducing hyperpigmentation. Emblica® is completely free of pro-oxidation activity utilizing a multilevel cascade of antioxidant resulting in a prolongation of its antioxidant capabilities including the protection against photo-damage. • Kakadu Plum - provides powerful antioxidant/free radical scavenging support and protection from the effects of UV exposure. Has the highest naturally occurring vitamin C content of any fruit. It contains 3000mg of vitaminC per 100g of fruit - over 50 times the concentration found in oranges. The Kakadu contains phytochemicals gallic and ellagic acids. Gallic acid has antibacterial, antiviral and antifungal activities and also shows antiinﬂammatory, anti-tumour, anti-mutagenic and anti- bronchodilatory activities.